Members of the visiting delegation from the Kitasato University School of Veterinary Medicine and Animal Sciences in Japan join PVM representatives at a farewell reception held in their honor: (left-right) First row — Dr. Tomohito Inoue, PVM continuing lecturer, anesthesiology; Dr. Michiko Tomioka (standing), Kitasato assistant professor, Laboratory of Clinical Veterinary Medicine for Large Animal; and veterinary students Terunari Twatsuki, Takayasu Masuko, Ysuke Kusajima, Kensuke Mori, and Koji Asakawa. Back row — Will Smith, II, PVM director of international programs; Purdue veterinary student Sophia Huang, of the DVM Class of 2019; veterinary students Mayuko Fukuzawa, Hiromi Miyauchi, Nanako Hayashi, Mai Yokoya, and Miho Oku; and Dr. Kathy Salisbury, PVM associate dean for academic affairs. Ten veterinary students and their faculty advisor from the Kitasato University School of Veterinary Medicine and Animal Sciences in Towada City, Japan, wrapped up a two-week visit to the Purdue University College of Veterinary Medicine Friday, August 25, with a farewell reception held in their honor in Lynn Hall, Room 1192. 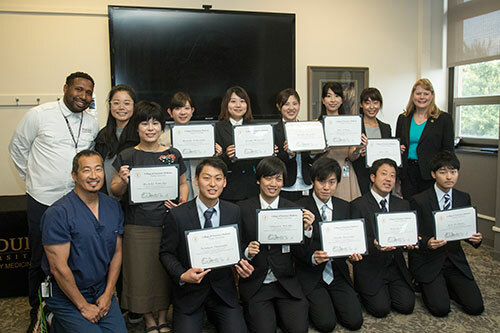 The Japanese veterinary students visited Purdue as part of a long-standing exchange relationship between Kitasato University and Purdue Veterinary Medicine dating back more than 20 years. During their stay, they spent time in the Veterinary Teaching Hospital gaining first-hand exposure to veterinary clinical education in the U.S. Their itinerary also included a variety of fun activities to introduce them to Indiana and area attractions and culture, including a summer picnic at Munger Park in Lafayette and visits to the Indiana State Fair and the Indianapolis Zoo. "We're sorry that you're going to be leaving, but we're really glad that you've been able to be here for the last two-weeks," Dr. Kathy Salisbury, PVM associate dean for academic affairs, told the Kitasato delegation at the farewell reception. "We look forward to your visit every year, and we really enjoy having you here, adding to our cultural diversity in our college, and we hope that you've had a really good time." Dr. Salisbury also thanked all of those in the PVM family who helped host the Kitasato delegation, assisting with outings and the daily activities in Lynn Hall. "We appreciate your support for cross-cultural understanding and international education that really has gone above and beyond the call of duty," Dr. Salisbury said. "So, thank you to all of you who made this program possible." The students and their faculty advisor, Dr. Michiko Tomioka, each expressed appreciation at the reception for the hospitality and learning opportunities provided for them during their visit. Also as part of the exchange relationship, Dr. Jan Hawkins, PVM professor of large animal surgery, will travel to Japan in November to visit the Kitasato University School of Veterinary Medicine and Animal Sciences. 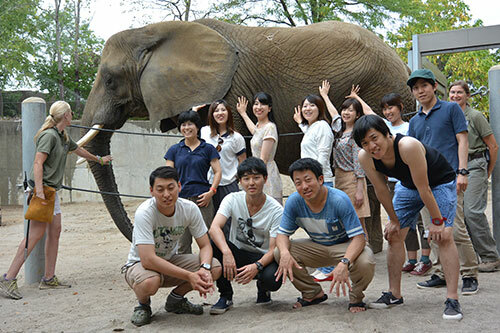 Touching an elephant at the Indianapolis Zoo was among the highlights described by the Kitasato veterinary students as they shared about their experiences during their time in Indiana. 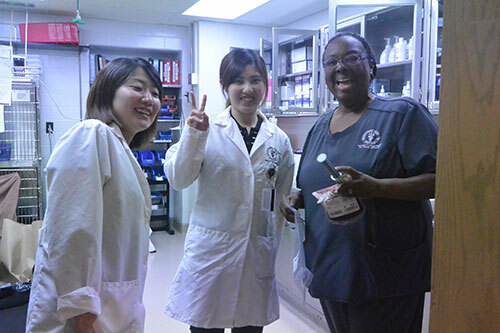 For some, this was their first visit to the U.S.
Kitasato veterinary students (left-right) Hiromi Miyauchi and Nanako Hayashi pause for a photo-op with Dr. Paula Johnson, PVM clinical assistant professor of small animal emergency and critical care. 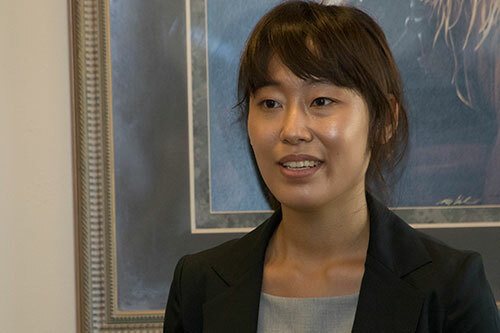 Kitasato veterinary student Miho Oku, as well as all of the other members of the Kitasato delegation, took turns at the podium during the farewell reception to express, in English, their appreciation for the hospitality, activities, and learning opportunities they enjoyed during their visit to Purdue. 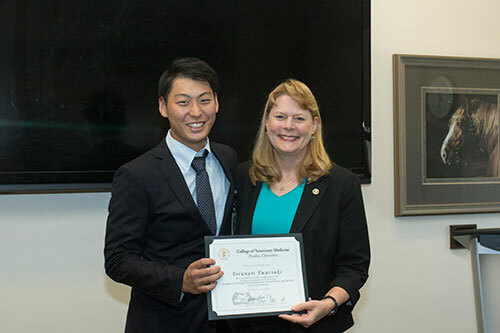 Dr. Kathy Salisbury congratulates Kitasato veterinary student Terunari Twatsuki at the farewell reception held in honor of the delegation from Kitasato University's veterinary school. Each of the Kitasato students and their faculty advisor received a certificate and recognition gift.